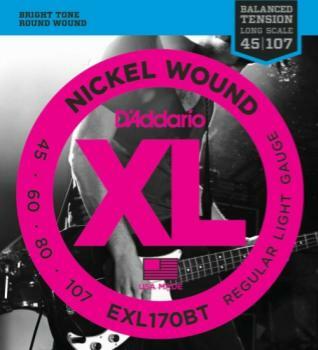 D'Addario EXL170BT Balanced Tension electric bass strings are comprised of mathematically optimized string gauge combinations, resulting in greater control and playing comfort. Combined with the distinctive bright tone of XL nickel wound strings, each set offers greater dynamic control and a more consistent feel between strings for evenly balanced bending, strumming, fretting, picking, plucking and slapping. Balanced Tension sets allow for evenly balanced bending, fretting, plucking and slapping.